What changes will make the 2018 Ram 1500 different? Possibly some feature bleed among models. Perhaps even another niche trim level. But nothing major because Ram is focused on developing the all-new 2019 version of its full-size pickup. More below on the next-generation Ram, due in early 2018. There’s likely life beyond that for the current generation, however: some versions could remain in production for a year or two alongside the redesigned truck. All that renders the 2018 Ram 1500 a sort of placeholder, but a vital one to its manufacturer, Fiat Chrysler Automobiles (FCA). Although it trails the Ford F-150 and GM’s Chevrolet Silverado and GMC Sierra in big-pickup sales, it is by far the best-selling vehicle in FCA’s portfolio of brands: Dodge, Chrysler, Jeep, Fiat, Ram Truck, and Alfa Romeo. After an 8.7-percent increase in 2016, Ram demand has tapered off, with sales up 4.5 percent through spring 2017. But the pickup remains a key profit-driver, easily outpacing any other vehicle in sales-per-FCA franchise. This review coves the half-ton Ram 1500 line. Maybe to see if Ram resumes sales of the diesel-engine option. Given an EPA investigation into alleged emissions violations, don’t hold your breath. Sales of the popular turbodiesel V-6 – the first diesel engine offered in a half-ton pickup – were suspended in early 2017, pending resolution of the matter. Ram’s trouble with emissions-control devices is not an isolated case. The EPA is also withholding certification of diesel versions of the Chevrolet Colorado and GMC Canyon compact pickups, as well as most Audi, BMW, and Mercedes-Benz diesels. Ram diesel sales could restart during the 2017 model year, of course. But that won’t alter the reality that waiting for any 2018 Ram would net you a pickup at the end of its styling and engineering life. The ’18 models won’t be materially different from their 2017 counterparts, but model-year inflation means they’ll likely cost more. You could wait to see if your world is rocked by a possible special send-off model with unique performance or appearance features. And FCA and its dealers are almost certain to offer huge price discounts to clear inventories of ’18 Rams ahead of the all-new ‘19s. Finally, if you’re a fleet buyer, reports suggest production of some versions of this 2013-2018-vintage Ram will continue for a period as lower-cost alternatives to the redesigned model. A ’17 Ram is a worthy pickup choice if somewhere in its lineup there’s a look, a powertrain, and a features set that appeals to you. That shouldn’t be difficult. There are 11 different models distributed among three cab styles. There’s a two-door regular-cab, a four-door Quad Cab with two part-sized rear doors, and a Crew Cab with four full-size doors. Regular-cabs offer a choice of a 6-foot-4-inch cargo bed or an 8-foot box. Quad Cabs use only the 6-ft-4-in bed. Crews offer beds of 5-ft-7 and 6-ft-4 in. Trim grades suit most every taste and need, beginning with the work-oriented Tradesman and ascending through Express, Lone Star, Big Horn, Laramie Longhorn, and Limited. The Sport and Night models focus on on-road performance and trendy black-out styling, respectively. And the off-road-oriented Rebel draws on the cred of the Ram 2500 Power Wagon. The diesel moratorium reduces engine choices to two, a gas V-6 or a Hemi V-8. Both are available with rear-wheel drive (2WD) or four-wheel drive (4WD). Buying a ’17 Ram will save you a few bucks over the little-changed 2018 truck. And you’ll be able to enjoy it for an extra model year before it’s rendered old hat by the all-new ’19 Ram. 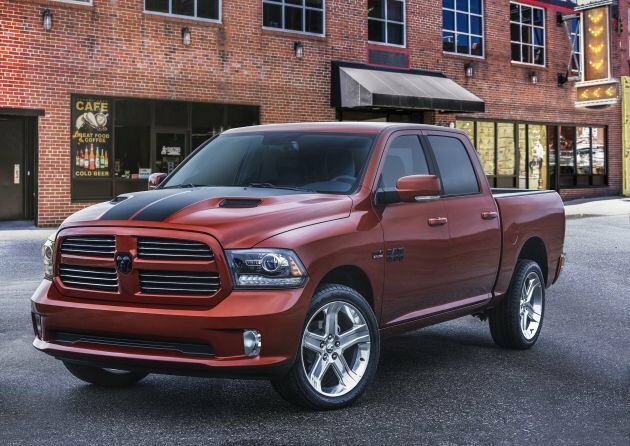 Ram could fiddle with 2017’s pallet of 12 available exterior colors (not counting two-tone combos). It could also create yet another trim grade with styling touches and features intended to tap some subcategory of luxury, sport, or lifestyle it hasn’t yet exploited. Otherwise, this pickup will return with the same big-boned, handsome shape that came on board with its model-year 2013 redesign. There have been minor tweaks since then, most notably introduction of grilles that exchanged the brand’s trademark crosshair insert for ones with “Ram” in block letters. Those variations distinguished the 2017 Rebel, Laramie Longhorn, and Limited models, and something similar could be used on a 2018 special. A special could also add yet another alternative to the array of 17- and 20-inch wheels of varying designs intended to compliment the look of each trim level. Unchanged will be exterior dimensions that situate Ram at the heart of its competitive set. With just three wheelbases (the distance between front and rear axles), however, it’s down by one to the four offered by the GM half-tons and the eight (!) underpinning the F-150 line. And like all half-tons — save the Ford and the Toyota Tundra — its extended cab model is likely to again come only with a short-bed box. But its passenger accommodations arguably lead the pack, with roomy, comfortable seating for up to six. Interior storage space is generous, too, and the available Rambox cargo-management system affixes lighted, locking, water-tight containers to the bed sides. On the downside, not everyone likes the ergonomics of the rotary dial used in place of a conventional transmission-gear lever. And in a curious omission, the tailgates aren’t damped and therefore prone to falling open with a heavy clang unless you supply the resistance. Not unless the diesel returns, and we hope it does. Introduced for model-year 2014, it marked the first, and thus far only, use of a diesel in a half-ton pickup. (The F-150 is set to add one as part of its model-year 2018 freshening.) Originally a Fiat design, the 3.0-liter turbodiesel V-6 had 240 horsepower and 420 pound-feet of torque. It was good for a 8,990-pound tow rating, 1,400 pounds less than the Hemi V-8, but with similar around-town punch and significantly better fuel economy. As of early 2017, FCA said it had developed a software fix for the emissions snafu. But it wasn’t saying whether the remedy would result in reductions to power, mileage, or towing ability. Barring the diesel’s resurrection, all cab/bed configurations of the ’18 Ram 1500 would again offer a choice of 3.6-liter V-6 with 305 horsepower and 269 pound-feet of torque or a 5.7-liter Hemi V-8 with 395 and 410, respectively. Both engines would again link to an eight-speed automatic transmission. Expect the six to deliver power that’s adequate for regular-cab Rams and lightly loaded Quad Cabs but severely wanting for a loaded Crew Cab 4×4. The more popular V-8 would furnish robust acceleration commensurate with rival V-8s, although the F-150’s twin-turbo EcoBoost V-6 with 365 horses and 470 pound-feet can challenge a big-pickup fan’s V-8 bias. Rear-wheel drive would again be standard – even on the off-road-oriented Rebel. The 4WD system available with the V-6 would probably again be a part-time setup not meant to be left engaged on dry pavement. An on-demand, full-time system that can be left engaged on dry pavement would return for the V-8. Both systems would again feature low-range gearing. The ’18 Ram will again stand out for a ride/handling combination we rank tops in class. Credit its exclusive coil suspension for a blend of comfort and composure the competition’s leaf springs can’t match. Add to that the air suspension avaialbe for Quad and Crew cabs that can level loads and adjust ride compliance and height, and you have a big pickup that’s a standout on road and off. Absent mechanical changes, highly unlikely. Expect 2018 EPA ratings to mirror the 2017 numbers. For V-6 Rams, expect ratings of 17/25/20 mpg city/highway/combined with 2WD and 16/23/19 mpg with 4WD. A mileage-maximizing V-6 model, the 2WD Tradesman HFE Quad Cab, would return at 18/25/21 mpg. For V-8 Rams, expect 2018 EPA ratings of 15/22/17 mpg 2WD and 15/21/17 2WD. By comparison, initial 2017 EPA ratings for the turbodiesel V-6 Ram, which used the eight-speed automatic, were 20/28/23 mpg 2WD and 19/27/22 4WD. There was also a 2WD HFE version, rating 21/29/24 mpg. Probably not, not this late in life. Modern pickups must have a wide bandwidth, supporting construction-site duty, farm and ranch work, suburban commuting, vacation towing, off-road rockling, and all manner of status projection and lifestyle symbolism. Add to that a demand for infotainment integration and a growing awareness of driver assists. Like every rival, the ’18 Ram will again blanket this spectrum with models tailored to each need as well as a wide assortment of comfort, convenience, and connectivity features. Interior décor ranges from cloth upholstery of various grades to leather with heated and cooled front seats, heated rear seats, and a wood-and-leather-wrapped heated steering wheel; the Laramie Longhorn’s cabin has European burl wood accents. Depending on model, standard or optional features include automatic dual-zone climate control, power sunroof, remote engine start, rear backup camera, LED bed lighting, keyless entry with pushbutton start, automatic high-beam headlamps, rain-sensing wipers, trailer-sway damping, power heated and folding mirrors, power front seats, power-adjustable pedals with memory, and rear-window defroster. Available connectivity includes Bluetooth linking, plus FCA’s Uconnect interface with an 8.4-inch dashboard screen and available with imbedded navigation, Siri Eyes Free iPhone linking, and WifFi hotspot. You’ll likely need to wait for the ’19 redesign for such features as trailer-backup steering assist, as well as safety adjuncts such as autonomous emergency braking and lane-maintaining automatic steering. They’ll almost certainly increase, given strong demand, although pricing could be tempered by Ram’s need to compete with rivals of fresh design. And don’t forget late-model-year incentives likely to be more generous than usual. Estimated base prices here include Ram’s destination charge, which was $1,395 for model-year 2017. You could expect a sticker price of as little as $28,200 or so for a 2WD regular-cab V-6 short-bed Tradesman. At the other end, you’re looking at an MSRP of around $62,000 for a 2018 Limited Crew Cab 4×4 with the standard Hemi and just a few choice factory options, such as the Rambox ($1,295), power sunroof ($1,095), and limited-slip rear differential ($435). Among notable trim grades, look for the Sport to start around $37,000, the Laramie around $40,300, and the Rebel around $45,400. In general, expect the 2018 Ram regular-cab to start around $28,200 with either bed, the Quad Cab around $31,900, and the Crew Cabs around $34,500 with the short bed and $35,100 with the long-bed. The Hemi should return as standard on the Laramie Longhorn and Limited models; figure about $1,500 to add it to the other models. And look for 4WD to cost an additional $3,500-$4,600, depending on trim grade. Expect a 2018 Ram 1500 release date in the third quarter 2017. Expect Ram to address most of the current truck’s shortfalls with the 2019 redesign. In addition to the aforementioned driver assists, expect a return to a conventional transmission shift lever (likely mounted on the center console). If you think the Ram 1500 needs more power, expect the next-generation 3.6-liter V-6 to boast direct fuel injection and to perhaps be joined by a turbocharged version. The Hemi will return, likely with more muscle. The diesel could of course return, while some reports speculate on a future Ram 1500 with a gas engine supplemented by electric-motor assist. Ram evidently doesn’t believe its half-ton pickup needs an all-aluminum body and bed, like the F-150, but the next-gen is expected to incorporate some aluminum exterior panels. Speaking of the body, look for styling that’s both more aerodynamic, partly via a more tapered but still-bold grille, and more expressive, thanks to body sides with prominent character lines.